Bryce Harper is not mad Mike Trout is not coming to Philadelphia. He is just thrilled the Los Angeles Angels star made his money. Trout is in the process of signing a 10-year, $365m extension with the Angels that will officially kick in during the 2021 season. The deal, including the final two years of the six-year, $144m contract he signed in 2015, brings his total agreement with Los Angeles to 12 years and $426 million. Harper signed a 13-year, $330 million deal with the Phillies this offseason. He spoke about wanting to bring Trout to Philadelphia as the center fielder grew up a diehard Phillies fan. Trout is staying put, though, with Harper thrilled to see his own mega-deal dwarfed by that of the two-time AL MVP. 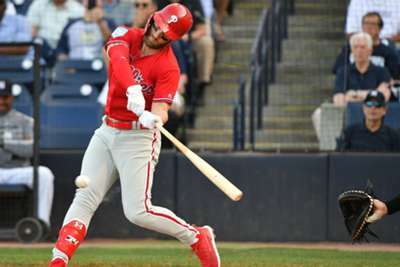 "When I talked to him this offseason, I told him: 'Man, I want to get as much as I can so that you can blow me out of the water pretty much,'" Harper told reporters. "And he did. I'm very happy for him." When Harper signed his deal it was the longest contract ever agreed to and the largest in total value. Trout's extension has passed it up monetarily in only a few weeks and is now the biggest contract in North American sports history. Still, Harper is more than satisfied with the deal he received. "I got more money than I know what to do with it," he said, via The Athletic.